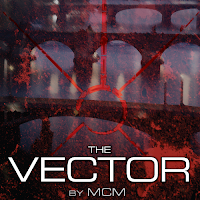 Today we interview MCM, author of the novels The Vector, Fission Chips, and countless others. Actually, the word prolific doesn't even begin to describe this author - in 2009, MCM achieved his personal goal of publishing 12 books in 12 months, making something like NaNoWriMo look like a walk in the park. 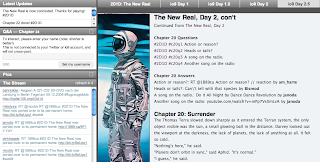 His most recent work, The New Real, is an example of livewriting - he wrote the entire story over the course of 48 hours, posting a new chapter every hour. Perhaps the most interesting aspect of this was the way that he involved the audience directly in the creative process, allowing them to provide real-time feedback via Twitter or a special website he built specifically for the purpose. He's also built his own online reader, which you can see in the image to the right. MCM is certainly one to watch. He's constantly pushing the boundaries of web fiction, and experimenting with new techniques for the form. His technical background combined with his zany wit and writing prowess allows him to craft a compelling story and integrate it with the web to create a form of storytelling that is completely new. It's exciting to watch the future of web fiction develop, and MCM is one of the people that's going to create it for us. He was kind enough to reply to my questions via email. I found his answers to be interesting and insightful, and I think you will too. How and when did you start publishing online? I honestly don't remember when I first started, but for the sake of simplicity, I'll say around the middle of 2006, when I released my first book, The Pig and the Box. That was just a PDF... I hadn't really looked at the options for books online, so it was a learning experience the whole way along. At the start of 2009, I moved to a new system that allowed me to post books straight to web pages, and started filling in content from there. I've done 11 books this year so far, and I've been evolving my methods constantly... my first serialized web fiction (Fission Chips) started in May, and my first livewriting book (Typhoon) was in October. Each one of those would be a "start" for me, because they're all so different than what came before. Why did you decide to publish your work as serial fiction on the web? The purest answer is that I really wanted the immediate feedback. My first such project, Fission Chips, wasn't a straight serial, because the audience got to suggest and vote on "what happens next" every week, and I had to create it on the fly. That kind of interaction can't work anywhere else. I didn't have much interest in going to traditional publishers (for a variety of reasons), but even so, the interactivity of the web makes it so much more interesting to write here. Writing is a dialogue, and the fewer delay mechanisms we have between the author and the audience, the better. What are the benefits of publishing online? What are the drawbacks? The benefit, for me, is the unpredictability. For my livewriting projects (Typhoon and The New Real, written in real-time over 3 and 2 days respectively), I got to tap into the collective insanity of the internet to help craft my story. The atmosphere during those events was just electric... you write a chapter and see the reaction immediately, and it gives you the push you need to do more. You can't do that anywhere else. It's just not possible. The other major benefit is that you can reach more people online than you can anywhere else. True, holding on to them is harder, but there are no restrictions. Offline, you might be buried in the back of a bookstore, or you might not even be IN the bookstore, and you have no way to change that fact. Online, you can drop a link to your work anywhere, and you never know who'll see it, find you, and stick around for more. The drawbacks, of course, are that very few people take you seriously. Being self-published in print gets you an eye roll, but publishing online makes people back away slowly. It's the "nephew art" curse that affects web designers... "Oh, what you do is nothing special. My nephew makes websites all the time!" Anyone can publish to the web, and anyone can write a story, so what sets you apart? In the end, there's nothing you can do about those people. If you do great work, and catch an audience, it doesn't matter what the world thinks of you. You're not doing it for universal recognition, you're doing it for the ones who call themselves your fans. Do you monetize your work? Why or why not? If so, how? I do, in various ways. For The Vector, I released under a Serial+ system, where a new chapter was posted Monday, Wednesday, and Friday, with a note at the end that said "it will take X more weeks to finish... if you want to read the rest now, you can upgrade for $5". I had pretty good conversion that way, I think because it gave everyone a chance to reach their personal tipping point. They held out until they couldn't hold out any more! All my books also have donate options in them, with a few options listed for convenience. I've found that if you leave it too open-ended, people won't donate. If you say "here are the choices," you get a lot more conversions. On occasion, I convert some of my works to print books (for those that say "I really want to read it, but I can't stand computer screens! "), but I'm definitely moving more and more to the online-only approach. What do you think web serials will look like in five years? "...the interactivity of the web makes it so much more interesting to write here. Writing is a dialogue, and the fewer delay mechanisms we have between the author and the audience, the better." something living and dynamic, rather than just pre-planned chapters on a schedule. I know some people are experimenting with "choose your own adventure"-type architectures, adding programming tricks to do cool new things. I think that sometime soon, the technology and the momentum will let people put their writing into the format that makes the most sense, rather than writing something in a certain way because that's what's expected. I also think that in five years, the Kindle and iPhone will have made the idea of e-fiction more palatable to the broader world, and traditional print publishers will still be resisting the change. That means the innovators and superstars of web serials will have a chance make their mark... if you have this device meant for reading, but there's very little to read (because publishers are waiting until the hardcovers have been out 6 months), you'll go looking for something else. Web serial writers need to be that "something else." We've got a year, maybe two to get there. So we've got to get cracking. What technical advances (current or near-future) are you most excited about experimenting with or applying to web fiction? I'm really interested in integrating AJAX goodness into the writing, but I'm still not 100% sure how it'll be done. Mike Cane and Piers Hollott have these notions of rich reading experiences with deep metadata, and I'm really interested in the "branch" effect of writing: select a word or a sentence and comment on that, or expand on it, or made a side-story... as much as possible, I want web fiction to be a starting point, not a final product. There's already so much discussion that goes on around web fiction, but it's highly fragmented. If we can at least create smarter windows into those conversations, it will probably mean a whole new world in terms of what is created. Who do you consider innovative in the web fiction space today? Who else is pushing technology in new directions to enhance the storytelling process? Right now, I'm very excited by an upcoming project by A.M. Harte. Her technique is very subtle (to the point of invisibility), but if it works, it will be a great new sub-genre for authors to explore. I can't say more, because I'm sworn to secrecy :) Also, Brian Spaeth really pushes the limits in a lot of ways at once... one of his new concepts will really be a multimedia tour de force, and when you couple it with his insane "alternate reality that may not be alternate" vibe... I'm certain it will blow your mind. What tips would you share with others interested in publishing serialized fiction on the web? Don't be constrained by architecture. There are different tools out there to do different things, and some will fit better than others. Think beyond the page. Think of new units, new transitions, new schedules and interactions and presentations and all that. Don't make "a printed book on the screen." So many people (myself included) are chained to that notion, and it's hard to change once you've started. If you're just starting out, find a boundary to push, and push it. Hard. The internet has endless possibilities, and we're only using a fraction. The trick to this game is patience. You'll start off with two readers, and they'll both be your offline friends. Four months later, you'll have one reader, and you won't even be sure they're really reading. But four months after that, you'll have ten readers, and then twenty, and then forty... Word of mouth takes time, and you have to remember the number one way to kill it is to release something sub-standard. You're only as good as your last chapter... but if that chapter is amazing, you'll be okay. I'd like to thank MCM for taking the time to discuss his work with me. The stuff he's doing is truly inspiring, and he's definitely got me thinking about the future of storytelling on the web. Be sure to check out The Vector, and all his other work at his website: 1889 books. To read more about the future of web fiction, check out 1889 Labs. Read the other interviews in the Profiles in Web Fiction series. MCM is an incredible author, and incredible innovator, too. We're all just riding on his coattails most of the time.